Make these once and you will be hooked! Promise! You can serve these with spaghetti squash or your favorite pasta!. It is delicious and I recommend you try them. Sometimes I create a meatball sandwich with a medium size portabella mushroom and that is a meal you won't forget. 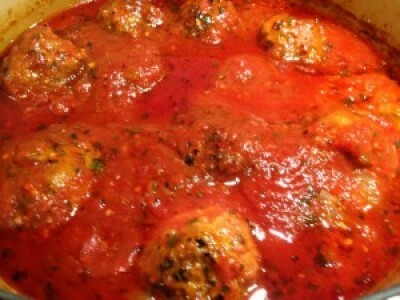 Other times I just like my meatballs in a bowl with my homemade sauce and just enjoy every bite! This make a full batch of meatballs! Just freeze what you don't use. Enjoy. Preheat oven to 350 degrees F. Line a baking sheet with parchment paper or non-stick aluminum foil. Meanwhile in a large pot prepare your sauce. Heat the olive oil in a large pot. Add the onion and sauté over medium heat until translucent, 5 to 10 minutes. Add the garlic and cook for 1 more minute. Stir in the tomato sauce, crushed tomatoes, parsley, salt, and pepper (add red pepper flakes if you decide to use). Bring to a boil. Add in your can of tomato paste and fill can with hot water and using a spool scrape all of the paste. Stir until tomato paste has dissolved, cover and lower to simmer. Add the meatballs to the pot and let them do their magic! NOTE! This is also a great slow cooker meal. Prepare the meatballs the night before! Get up in the morning and put the sauce and meatballs in the crock pot on low and when you come home for dinner! Meatballs are ready!